Most hardwood flooring is sold by the square foot. So when you are shopping for new flooring, it’s always a good idea to have an estimate of how many square feet you will need. Here is a simple way to calculate the total square footage needed for the area you are planning to cover. Square off each section of the room. For example, if the room includes a closet or a hallway, consider each as a separate section. Breaking a room up into manageable squares can be especially helpful when measuring irregular-shaped rooms, often found in older homes. For each squared-off section, use a tape measure to determine the length and the width, making sure to measure from wall to wall or baseboard to baseboard. 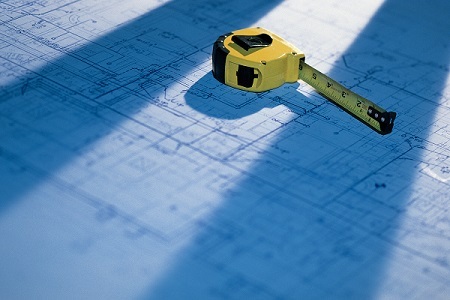 Multiply the length times the width to calculate the square footage. It is often easier to round up. So if a space measures 12.6” x 14.2”, for example, multiply 13 x 15 for a total of 195 sq. ft.
Add the square footage of each section/room measured to determine the total square footage. Add an extra 5% to the total square footage to allow for any damaged boards and possible waste from cutting and fitting during installation. For example, if the total square footage is 500 sq. ft., you will multiply 500 x .05. This equals 25, which means you will add an additional 25 sq. ft. (500 +25), giving you a new total of 525 sq. ft.
Keep in mind, waste percentages may vary by product. For laminates and domestic hardwoods, an additional 5% is usually sufficient. However, corks, bamboo, and most exotic hardwoods may require as much as an extra 10% to 15%. Also, if you tend to be particular about variations/ imperfections in planks, or if you are ordering closeouts, odd lots, or other one-of-a-kind deals that will be harder to re-order later, you’ll probably want to go with a higher waste percentage of 10% to 15%. Hardwood flooring is typically sold by the carton. So, once you know how many square feet are in a carton, divide your total square footage by the number of square feet per carton (rounding up to the nearest amount per carton). You may also want to add an extra box of material to keep on hand for any future repairs.